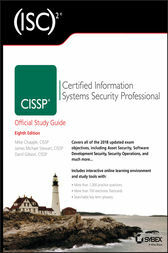 CISSP (ISC)2 Certified Information Systems Security Professional Official Study Guide, 8th Edition has been completely updated for the latest 2018 CISSP Body of Knowledge. This bestselling Sybex study guide covers 100% of all exam objectives. You'll prepare for the exam smarter and faster with Sybex thanks to expert content, real-world examples, advice on passing each section of the exam, access to the Sybex online interactive learning environment, and much more. Reinforce what you've learned with key topic exam essentials and chapter review questions. Six unique 150 question practice exams to help you identify where you need to study more. Get more than 90 percent of the answers correct, and you're ready to take the certification exam. Mike Chapple, PhD, CISSP, Security+, CISA, CySA+ is Associate Teaching Professor of IT, Analytics and Operations at the University of Notre Dame. He is a leading expert on cybersecurity certification and runs CertMike.com. James Michael Stewart, CISSP, CEH, ECSA, CHFI, Security+, Network+, has focused on security, certification, networking, and various operating systems for more than 25 years. He teaches numerous job skill and certification focused courses. He has authored or coauthored more than 75 books. Darril Gibson, CISSP, Security+, CASP, is CEO of YCDA, LLC. He regularly writes and consults on a variety of technical and security topics, and has authored or coauthored more than 35 books.